EVOLUTION OEM Series IV is a 100% fully synthetic motor oil engineered to meet the exacting specifications of the major global Original Engine Manufacturers (OEMs). EVOLUTION OEM Series IV Fully Synthetic Motor Oil is formulated with the world's most advanced additive package to provide peak performance, exceptional durability, ultimate protection, and outstanding cleanliness in extreme conditions. 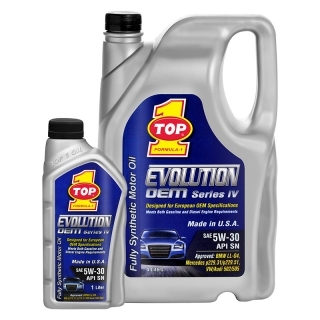 EVOLUTION OEM Series IV is the highest quality motor oil available from TOP 1 Oil. It is recommended for all types of modern gasoline and diesel passenger cars, SUVs, light vans and trucks. 5W-40 is approved by Porsche A40 (Porsche does not approve 5W30 viscosity). Backwards compatible with API SM/SL/SJ. Maximum lubrication and superior wear protection. Outstanding thermal and oxidation stability - protects engine from oil thickening, sludge buildup, and varnish deposits. Formulated for extended drain intervals. copyright (©) 2019. PT. Topindo Atlas Asia. All rights reserved.